Enfield House Holiday cottage is located in the scenic rural hamlet of Nymet Rowland in Mid-Devon. Its geographic position gives exceptional and easy access via A377 to the Cathedral city of Exeter and its many cultural and shopping possibilities, with easy reach coastlines just a 15 minute drive on. Or, head in the opposite direction to the amazing long sandy beaches of North Devon. Giving you the option to explore two very different but equally beautiful coastlines. RHS Rosemoor, wild and stunning Dartmoor, and various National Trust/ Heritage sites are all located close by. Our cottage has numerous leaflet and maps to help you explore. Our self-catering holiday cottage has its own parking area, steps up to the front porch and secure double-glazed front door. The well-equipped kitchen-diner downstairs has a washing machine, dishwasher, built in cooker, extractor and under counter fridge and freezer, smoked glass table with four chairs, cupboards, shelves, boot rack and coat hooks; with plenty of space left for luggage and shopping. Totally practical for every eventuality of self-catering, yet carpeted dining area and colour changing ceiling light makes for intimate dining. Upstairs the airy carpeted bedroom has a memory foam mattress on a king size bed, insulated curtain to allow you to sleep in, bedside drawers with lamps (also fairy lights in a glass vase), double wardrobe, handy chair and a full-length mirror. Next door the shower room has a venetian blind, sturdy grab rail handles in the shower – which is bigger inside than it looks, basin, toilet and charger outlet. At the end of the landing is the super cosy snug. A friendly room located at the back of the property, it overlooks the garden and fields. It has a large well sprung two-seater sofa decorated with plump cushions, an armchair and matching footstall and wooden cupboard on which there is a smart TV (suitable for streaming). Inside the cupboard you’ll find a DVD player (will take blue ray) with a few DVD’s for an assortment of easy reading books. As well as the main ceiling light there are two modern led lamps at each end of the sofa and fairy lights draped over the tree branch, hopefully giving you viewing, reading and romantic lighting. Outside your holiday cottage has easy access grassed area and a private patio that catches the sun during the summer, with bistro table and chairs plus two sun loungers (if there not out please ask). The area has a well planted hedge between the holiday cottage patio and owners garden, with a low trellis fence around the other secluded sides so you don’t lose the remarkable views of the garden, pond, fields and wildlife. During the day you will see a variety of different birds, maybe a shy snake and cheeky squirrels. By night you will hear owls and see bats, larger nocturnal animals do wander the gardens but are harder to catch sight of. Clouds permitting the stars are stunning we never tire of looking up. If you walk the local lanes you may see the dairy herd, sheep, horses, cats from the local farm and possibly a fox or deer. We do recommend bringing some sturdy boots if you wish to follow the many footpaths across the local fields (the views are stunning) or walk in the nearby woods and forests; they’re also quite useful if you plan to visit Dartmoor or Clovelly with its hard-cobbled streets that descend to the seafront. The lane walk to the local Spa shop is approximately 1.1 miles. The Boring Stuff – Enfield House Holiday Cottage has its own liability insurance up to £5’000’000.00. It complies with a fire risk assessment and has two fire extinguishers – one on each level, a fire blanket by the stove, recommended fire detectors for kitchen and hallway areas, and since there is only one entrance/ exit door a portable escape ladder stored in the bedroom. We also have a 2018 Health and Safety risk assessment to ensure good practice. 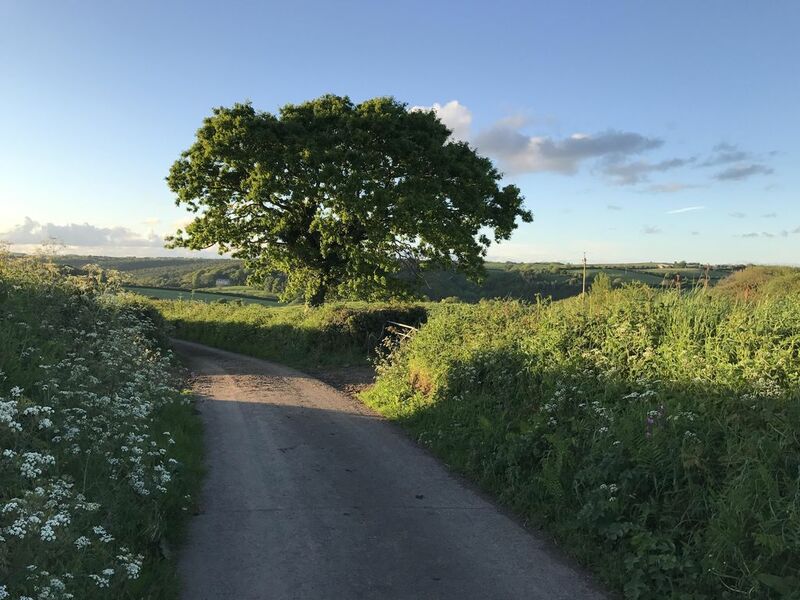 I fell in love with Devon through my own holiday visits, I most particularly treasure this part for the breath taking views I see on every walk or drive I take, and for the fabulously friendly local people. Nymet is the most peaceful place I have every lived, you just look about you, drink in energy and relax. Nymet is 1 mile from the A377 so great for main road access to explore all of Devon. Peaceful with local footpath walks and within easy driving distance of some great and note worthy places to visit, some of which are listed on our holiday cottage website Come and see for yourself we're super friendly and welcoming. So far as I know every house in Nymet has its own wonderful view, we are lucky enough to be surrounded by fields, hedges, animals and big old Oak trees. You can walk the lanes knowing that you are more likely to meet people than cars. Its not unknown to walk the lane and meet a trailor parked up by a hedge with a local farm tossing turnips over it to the sheep, or find one of the herds being moved from one field to the next. And nothing, but nothing can beat seeing a full size deer wander out of a hedge in the early morning light and then just saunter off. The inside of our holiday cottage is well furnished and cleanly decorated, one of our best compliments is how comfortable the kingsize bed and pillows are. Guests love our cosy Snug with well sprung chairs and Smart TV. The open plan kitchen dining room has room to store boots, coats, bags, and suitcases. All rooms have ambient lighting, we want our holiday cottage to be a home-from-home for you. If you love peace and nature our peaceful holiday cottage is the place for you, with the benefit of knowing that a full range of restaurants, shops and entertainment can be found in nearby Crediton or pop further on to wonderful Exeter for the full city experience. If you've driven around London then Exeter is heaven to drive around and park in. Heating on timer with radiator valve adjustment and thermostat in Dining area. Additional electric heater provided. Parking for one car, daytime visitors are welcome with notice to arrange extra parking. No parking in the lanes outside. The Kitchen has great views; Electric Oven, Induction Hob, Extractor, Microwave, 45cm Dishwasher, Washing Machine, Fridge, Freezer, Kettle, Toaster, assorted pots, pans & cutlery. Vinyl Flooring. Great local walks, Dartmoor within easy driving distance, historic city of Exeter 30 minutes drive - visit Exeter Cathedral, National Trust Properties, RHS Rosemoor, great beaches choose from two coastlines, enjoy local festivals throughout the summer. You can also book visitor membership at North Devon Yatch Club and there are three local golf clubs - Waterbridge, Crediton & Chulmleigh. Devon is a huge county, being in Mid-Devon gives you great central access to explore the country. I particularly love architecture and would recommend a visit to Exeter Chathedral and Castle Drogo (National Trust). The beach we love best is Instow, you can watch the yatchs and enjoy safe sandy beaches with good local amenities. Dartmoor is worth driving to with breathtake views and exhilarating walks. We also have lovely Flashdown wood and Eggesford Forset to walk in and watch the wildlife. Best local place to eat is The Old Malt Scoop Inn at Lapford which is walkable if your fit. Crediton is our biggest local town with large supermarkets and boutique shops, if you're looking for bright unusual clothes I recommend 'Snobs'. If you like to sail join North Devon Sailing Club as a visitor there website is very helpful. The pace of life here is slow and easy, the biggest traffic hold up is likely to be a tractor or someone moving livestock up the lane.